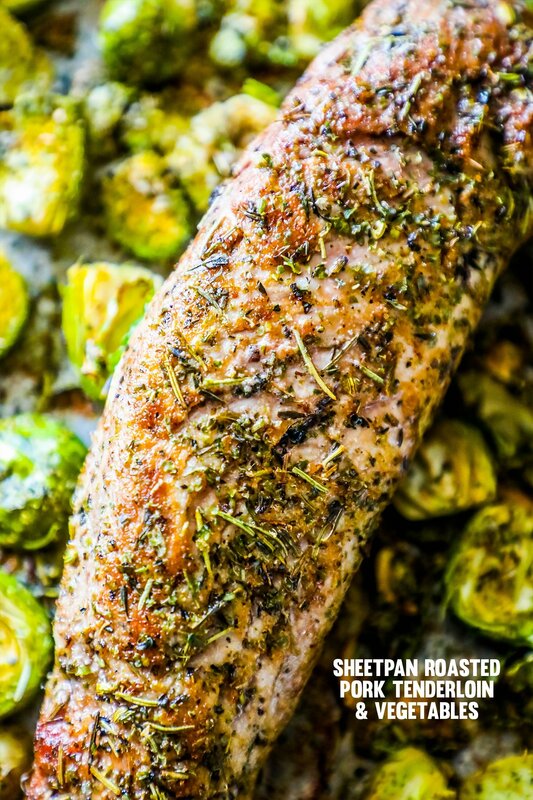 Sheet pan roasted pork tenderloin and veggies is a delicious, super-easy meal that is great for meal prep or a healthy dinner the whole family loves! Pork is one food that always intimidated me until I had a good handle on it. I would often freak out about it being undercooked, and end up completely overcooking it to the point of being dry and tasteless. Once I finally mastered pork cooking methods (a proper sear is KEY to sealing in pork’s flavor and juices), it became my absolute favorite thing to make, hands down. 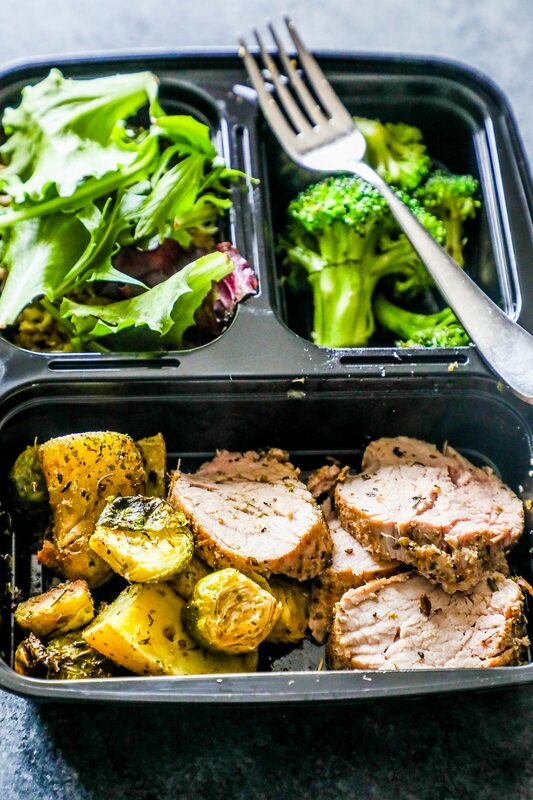 Pork tenderloin, in particular, is perfect for meal prep – it reheats well without drying out, it can be sliced thin (I love it for sandwiches! ), and it’s filling and full of flavor without being fat-laden or too heavy- perfect for lunch! 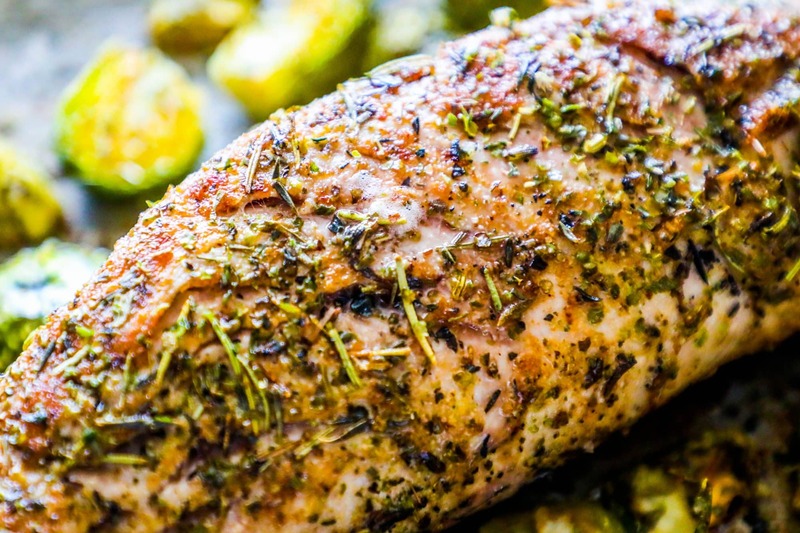 To prevent dry pork, two things are really important – 1) searing on all sides helps to lock in flavor; 2) pork (like all meat) really needs to rest for at least five minutes when you pull it out of the oven before cutting it – or all the juices will run out. 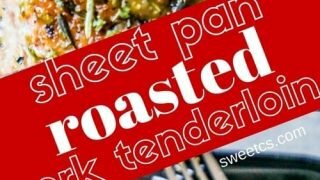 For a perfect take to work meal, add a small side salad to this dish! 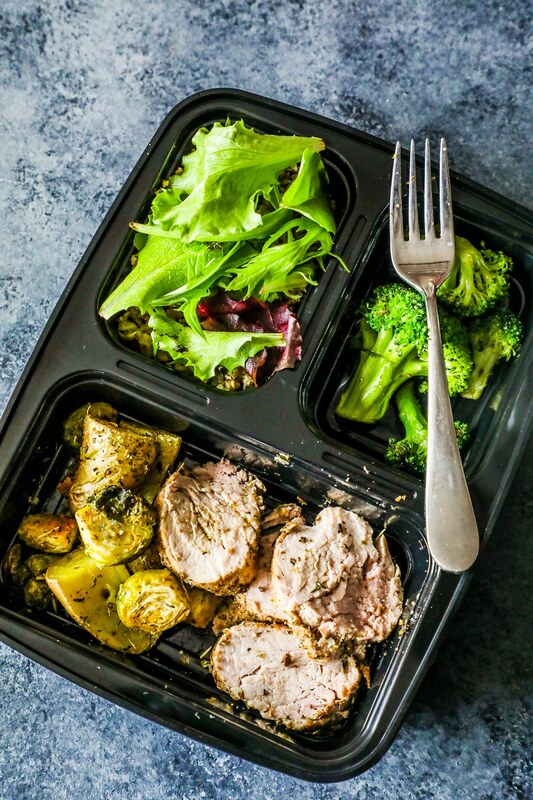 For my absolute favorite meal prep bowls ever (BPA free, dishwasher safe, and perfectly shaped) head here (affiliate link)! 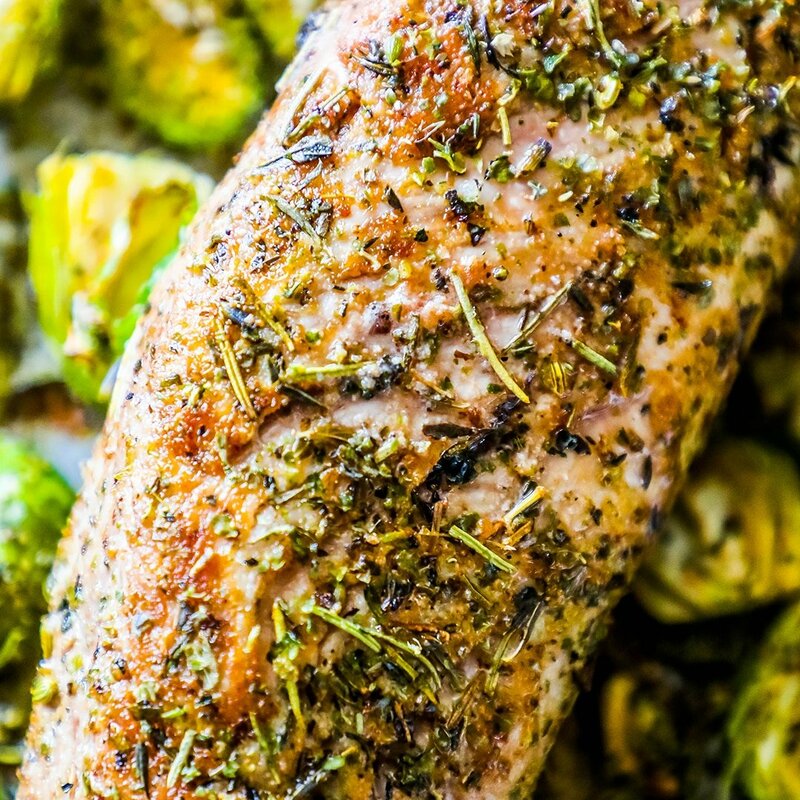 In a small bowl, mix olive oil, seasonings, salt, and pepper to make a marinade. Using about 1/4 mix, cover pork tenderloin and rub around so it is evenly seasoned. Heat a large, heavy pan, over medium high heat until scorching hot (but not smoking). Add high-heat oil, and swirl around pan until shimmery (about 40 seconds). Add pork to pan and brown on all four sides (about 3 minutes each side if scorching hot). When pork is browned, remove from pan and place on baking sheet. 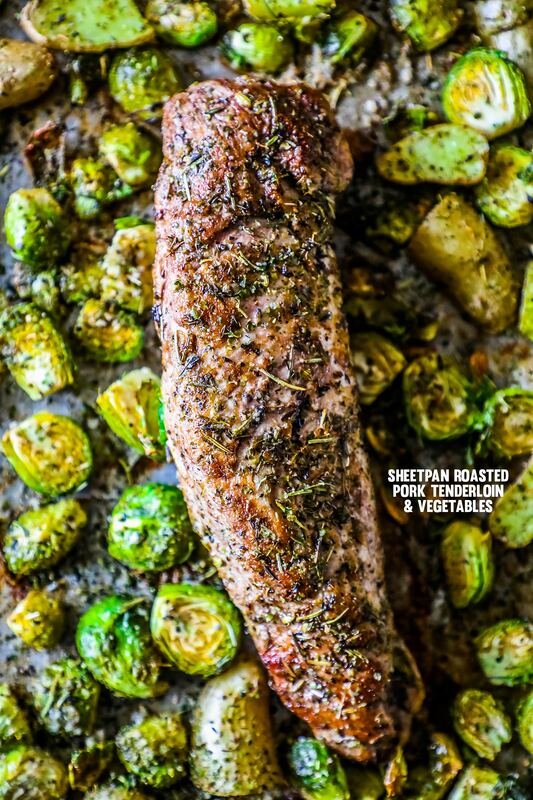 Add brussel sprouts and potatoes to baking sheet around tenderloin. Cook 20-25 minutes, until an internal temperature of 150-155. Remove from oven and let rest a minimum of five minutes. Thinly slice pork and portion with brussels and potatoes.